Pursuing our ancestors in the local newspapers of the time can reward us with some pretty specific nuggets, particularly if our relations lived in a small town. The editors were always on the lookout for something to fill up the pages, some of which was pretty mundane ("Mr. Smith was in town yesterday doing business at the post office...he reports a fine litter of pigs was born at his place."). The Mr. and Mrs. Eckerson, were John and Estella Channell Eckerson, parents of Harold L. Eckerson. 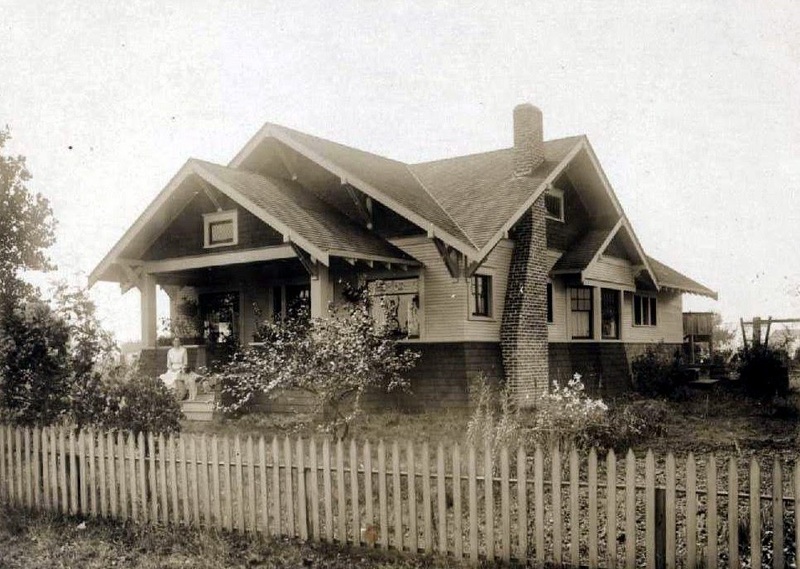 Harold was 11 when they moved into the house, which was located on Harrison Avenue in Centralia. This photo shows how the house looked some time later, after some shrubbery had matured. Stella was widowed in 1922, and lived out much of the rest of her life in the house alone, except for the period of time she offered room and board to her bachelor uncle, Sam Channell. Sadly, the house declined over time, and is now the home of a used car lot, with traffic whizzing by on the widened road. Going to visit today is like picking a scab, you know you shouldn't do it, but you can't help it. Interesting to note that some of the leaded glass panes are still in place. Two different bookends to the life of a house: the newspaper announcement of a fresh beginning, and its final chapter as a forlorn sales office.